fabric open cockpit biplanes of the 1920’s, to the dawn of the space age in the 1960s. In this unique and authentic setting, Canadian AIR & SPACE Museum celebrates the aerospace accomplishments of Canadians, and the long association of Canada with aeronautical innovation, aircraft manufacturing, military aviation, air transport and the pure joy of flight. View historic aircraft displays, engines, and in-progress restorations. Stand on the spot where Canada's first satellite, Alouette I, was assembled. Visit our historic home - an original de Havilland Aircraft of Canada manufacturing plant, where 1500 Tiger Moths were built and the famous Chipmunk and Beaver aircraft were born. Learn about Canada's proud aviation history. Explore the role of the Defence Research and Development Canada in helping pilots, divers, and astronauts survive in their unfriendly environments. 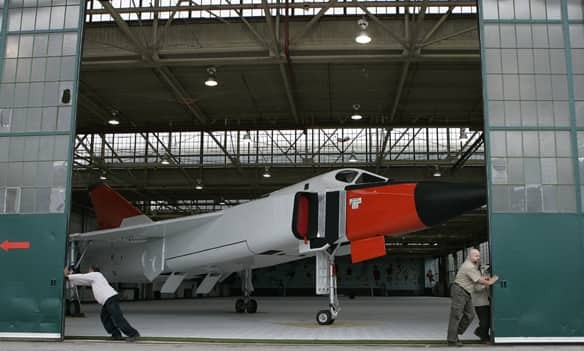 See our full-size, all metal replica of the Avro Arrow.